One Seattle highway has unenforced speed limits, reckless drivers and accidents so common that one commuter says it’s not a matter of if you get into a crash, it’s when. No, this path of pavement doesn’t involve cars. The Burke-Gilman Trail, which runs from Bothell to Ballard and mixes bicycles and pedestrians, is one of the most popular in King County. But the jampacked nature of the trail and the rising tensions create a dangerous atmosphere for all involved. A recent investigation found that speeding cyclists - disregarding the 15 mph speed limit and routinely blowing through posted stop signs - are a danger on the trail. One Lake Forest Park resident who lives near the trail told KIRO Radio that in his estimation, “95 percent of bikers fail to stop when required.” Distracted pedestrians, some oblivious to their surroundings as they listen to music or text, also hold some of the blame for the string of crashes on the trail, which sees more than 3 million annual users. Trail veterans and officials believe several things could be done to make the 27-mile trail safer. Many pedestrians point to the speeding cyclists as the main problem, clamoring for increased enforcement of the rules. Cyclists say the trail needs better upkeep and maintenance in order to truly be a safe and cheaper alternative mode of transportation. Who Is At Fault If You’re Hit By A Bicyclist? As with pedestrian accidents involving motor vehicles, accidents that occur when a bicyclist collides with a pedestrian can be complex and happen for a number of reasons. As stated above, both parties can be at fault in these situations, and oftentimes the blame is shared in these accidents. This is called comparative negligence, and each party must present evidence to illustrate that the other party was more at fault for causing the wreck. Preventing these collisions can be a headache for authorities. In general, many bicycle/pedestrian accidents take place at crossings, junctions or on pavement - spots on the road or trail where things get congested. These situations can be tricky. If you are a pedestrian walking lawfully on the sidewalk and a bicyclist hit you due to their reckless nature, you can file a claim for your injuries. On the other hand, if a pedestrian is distracted and causes a law-abiding bicyclist to crash, the bicyclist could file a claim against the pedestrian. As more and more people opt to ride a bike - either for pleasure or to commute - the safety concern for pedestrians is rising. In Great Britain, a recent study found that the rate of bicycle/pedestrian accidents has gone up by 47 percent in the past seven years. In London, there’s a crash every day. But a 2014 study in the Journal of Safety Research found that the rate of pedestrians injured in collisions with cyclists in New York and California has decreased over time. The study gave two reasons: 1. less exposure of children to cyclists, and, 2. improvements in the cycling infrastructure. 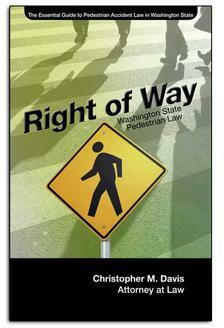 In many cases, a person's own insurance policy will often provide coverage if they are injured as a pedestrian. If the pedestrian or cyclist is carrying Personal Injury Protection coverage (PIP) - which is considered a “no-fault” type of insurance - that will help cover some or all of the medical expenses. Some cyclists carry a bicycle insurance policy, which can be added to many homeowner's policies and covers collisions with pedestrians. If you or someone you know has been hit by a bicyclist, it’s important to understand your legal rights. An experienced personal injury attorney can help you secure the compensation you deserve while you recover from your injuries. An attorney with a strong track record of representing pedestrians injured in collisions with bicyclists can handle the ins-and-outs of your claim. 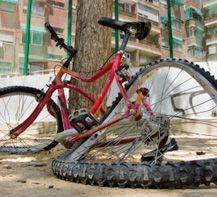 The Davis Law Group, P.S., has represented injured victims of serious accidents involving bicycles, pedestrians, and other similar incidents for more than 20 years. Our bicycle accident lawyers will review your case for free, and there is no obligation to hire an attorney if you meet with us. Use the confidential contact form on this page or call (206) 727-4000.